Tajo’s tale takes off somewhere in the middle and works its way forward and back to the very beginning with flashback, backstory, foreshadowing and cliffhangers that leave the reader dangling along with the characters. Yet, it is clear that Tajo is a trustworthy narrator who always knows what’s coming. He lets the reader in on a need-to-know basis and it is well-played as it adds excitement and a sense of urgency to the plot. The structure works. The girders sloped down toward the upper deck of the bridge. I was riding a roller coaster on the back of a gigantic snake! I looked down to my left. The bridge traffic was still pretty heavy. Cars sizzled past and their colors flashed in the streetlights; white and red and black and silver, mixed in with the yellow darts of cabs. I heard trucks rumbling on the lower deck… Out past the pedestrian walkway, it was a long, long way down to the East River. And there he was passed out on the cellar floor next to that big old pile of junk, not far from the boiler and Daray’s den… The super. Everyone called him Vinnie, but his real name was Wienczyslaw Bogucki … Vinnie was fifty bazillian years old, and he started in on the vodka everyday by 10:00 a.m. His white hair looked like a dirty bird’s nest, and you could have made a map of Wrinkletopia out of the lines on his face, not to mention the glow of his boozy-red nose that would make Wrinkletopia look like it had just been nuked. Why do I dance? … Can you imagine what it’s like to be a bird and fly, to break free of gravity and soar up to the clouds? I don’t know a single kid who hasn’t dreamed at least once about flying over the towers of Manhattan, but ballet kids feel like we can actually do it… I love feeling my body move, using all these different muscles that I never knew I had. Aunt Lola took me to see Billy Elliot on Broadway… and when it was over, I was shaking so much I could hardly walk. Tajo also claims to have no filter and the same is true for some of the other characters, my favorite being his potty-mouthed little sister, Tanna. She is a scene stealer. “Tanna had a dirty mind for a ten-year-old. I think she watched too much TV.” Tanna is also a major player in the story—a switch hitter. You never know if she is friend or foe. She is watchful and shifty. Likewise all of Stanford’s characters are robust and real and sometimes raw. Stanford doesn’t hold back. Some of the scenes are edgy and some are more than a little provocative. Tajo isn’t a perfect character and the things he does—although done for love—make him more appealing because sometimes good people do bad things and bad people do good things. Tajo does both. Stanford gets this and that is why Tajo, along with his fabulous supporting cast, is such a terrific teen character, so believable with his old-soul, wise-cracking, kid-cussing ways. Clearly, Stanford gets teenagers and is fluid in their speak. The epicenter of the story is the relationship between Tajo and Daray, whose character is also full of heartache and whose transformation and its aftereffects eventually divide the boys. 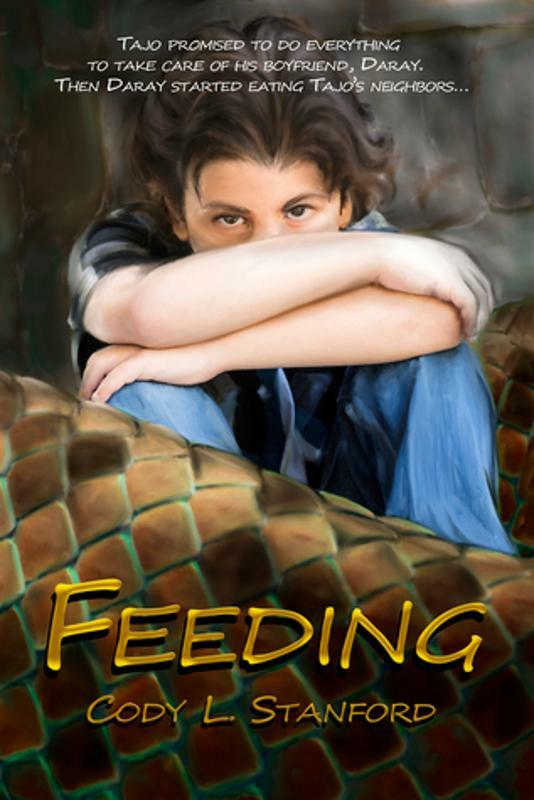 Cody L. Stanford’s Feeding is pure allegory as it symbolizes the darker side of love and the dangers hidden within the fragile teenage heart. Cody L. Stanford lives in Kansas. He attended the University of Missouri at Kansas City and is fascinated by the arts, history, mythology, sexuality, and other elements that shape the forces and foibles of human nature. His stories and novels have been published in Midwest Literary Magazine, Aphelion, Gypsy Shadow Publishing, Storm Moon Press, Etopia Press, Collective Fallout, Blood Quarry, The New Orphic Review, and Toasted Cheese. When not writing, he occasionally spends time working with tigers and other exotic cats at a nearby feline conservation park. This entry was posted in Issue 16:2 and tagged Candle-Ends, Cody L. Stanford, Harpspeed, Reviews, Shelley Carpenter by TC Editors. Bookmark the permalink.